Welcome to The Puriton Inn, a traditional country pub situated on the edge of the Somerset Levels. We welcome guests from all over the UK who come to see us and enjoy our great beer and excellent food. We're situated just a minute or so from the M5 Motorway (at Junction 23) so, if you're in the area, why not pop in for a drink or a meal? We will be really pleased to see you! We look forward to seeing you 'down the Inn' soon! As some of you may be aware, we have made the decision, after 14 fantastic years here at The Puriton Inn, that it is time for ventures new! The lease is now up for sale. The lease has 14 years left on the 20 year rolling lease, which is still on the old Whitbread/Laurel lease. It's a wonderful pub in a such a lovely village, where I am honoured to have been landlady for so long. If anyone has an interest or would like some more information, please email info@thepuritoninn.co.uk or call Christell on 01278 683464. Looking for a venue for an event, party or celebration? We can cater for both indoor and outdoor events. 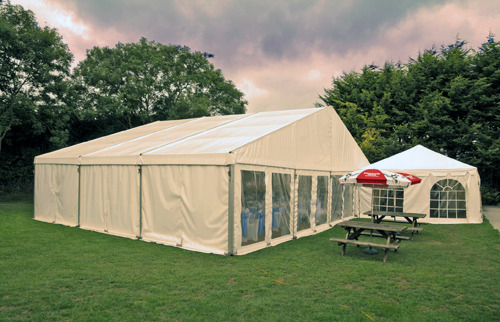 Our large rear garden can be used for a marquee - just click on the picture below to go to our Events page.